Our Student Spotlight for this week focuses on the winners of the First Year Case Competition, a team that included Ben Walch, Kate Grondin, Neve Pianarosa and Evan Urquhart. 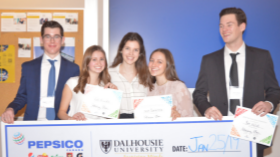 The First Year Case Competition is an annual event hosted by the Dalhousie Commerce Society that takes place in the Rowe building. We caught up with three of the team members, Ben, Kate, and Neve to hear more about their experience in the competition. Each of the group members are from Calgary, Alberta, and were drawn to Dalhousie’s Commerce program because of the mandatory co-op. What did you learn from the First Year Case Competition? Ben: I gained valuable case experience by competing. I have heard that many upper-year classes are often case-based, so I will be one step ahead. I also learned how to work as a team from an academic standpoint, as most of the teams I’ve been a part of in the past have been athletic. Kate: I learned how much information one must evaluate when looking at a case of this size. Because we were given an actual problem PepsiCo was facing, we had to apply all our knowledge from past classes and the outside world to come to a viable solution. This taught me that there can be many alternative solutions when it comes to a problem for a company of this size because many factors come into the decision. Neve: I learned that dividing the workload between team members and really knowing what you are talking about is the key to success. I also learnt to have confidence in my teammates and trust that they know what they’re talking about. What skills did you develop through competing in the case competition and how do you see yourself applying those skills in the future? Ben: I think that I developed better time management and public speaking skills. My time management skills were developed as we needed to find all the important information, create our different solutions, and put it all together in our PowerPoint within a small time frame. Everything we did had to be organized and purposeful. I think that my public speaking skills improved because I had not presented without a script in front of such a large group before. This public speaking experience was significant because I’m now more confident in my skills. I think that both of these skills will be useful on my co-op because I may need to present my work to a large group of people that I don’t really know. Kate: My communication skills improved immensely. When we were announced as finalists, my stomach dropped, knowing we had to speak in front of all of those people. This was very intimidating at first, but once we got up front I felt confident speaking and answering their questions. Another skill that I improved was my ability to work as a team. We talked openly about ideas and alternative solutions which allowed us to generate our best ideas. In the future, I know that my communication skills and ability to work well in groups will be crucial for my success in the workplace. Neve: Working on something that I do not know much about and figuring it out along the way is something I most definitely will have to do in the future. How did your group play to each other’s strengths and work effectively as a team? Kate: As a team entirely from Calgary, who knew each other prior to Dalhousie, we had an advantage because we had a strong bond to begin with. We divided the work and began tackling points of the case, such as S.W.O.T analysis or Decision Matrix, individually. When one team member was stuck, we would open the problem up to everyone’s perspective, in order to come to a consensus on how to approach said problem. Our biggest strength as a team was trusting one another and listening to everyone’s ideas. It was a true honour to win this award with some of my closest friends. Has this experience made you want to participate in future case competitions? If so, what would you do differently next time? Ben: Yes, all of the members in our group had a great time because we all work well together and enjoy solving problems. Kate: This experience has opened me up to a whole world of Commerce opportunities that I didn’t even know existed. Next year, I plan to join the J.D.C.C. In the future, I would definitely research the company prior to the competition. This is a key asset to a case competition as company values and their mission will be important factors in their decisions and our consensus on the case.